Face Nourishing Oil by Ayurvedic Skincare range Rasasara Skinfood. 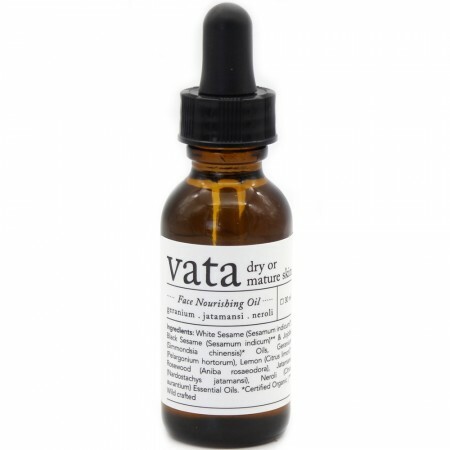 Suitable for dry or mature skin and Vata dosha. Enriched with hydrating Jojoba, White and Black Sesame oil and infused with antiseptic, anti-inflammatory and anti-bacterial essential oils. 20ml. Deeply moisturising skin serium and everyday moisturiser, suitable for dry or mature skin. Suitable for balancing Vata dosha. Protect, restore and balance the skin. Improves circulation, stimulates cell growth and strengthen connective tissue. Infused with Lemon, Geranium, Rosewood and Jatamansi essential oils.